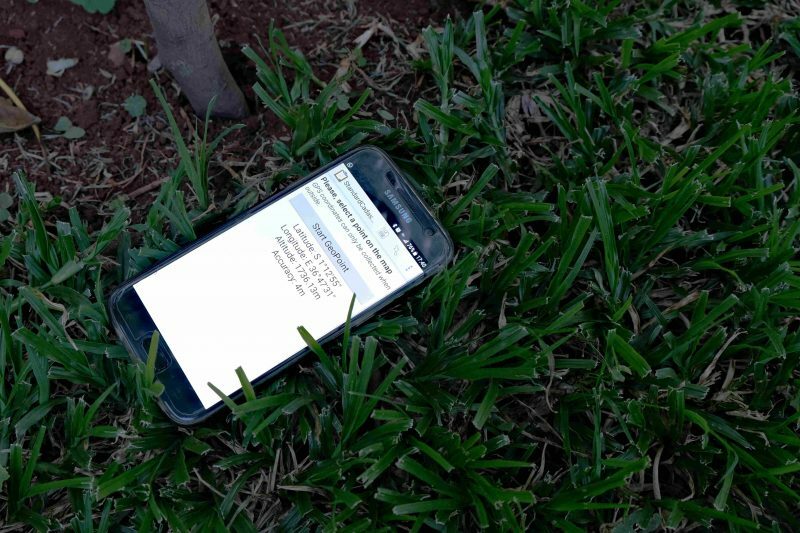 This is the next in the series of blog posts on research into applying ICTs to the data capture element of land registration. The previous blog post was titled: Technical Thresholds Required for Demarcation of Individual and Community Land in Kenya. That cheap and widely available tools that can be used for land demarcation exist. That these tools can reach the demarcation threshold required by the Kenyan government in terms of accuracy and attribution. That the communities, using these tools, can replicate the work of a professional surveyor. To test these assumptions, we conducted a series of experiments in 2017 in Taita Hills, Taita Taveta County. We first examined the process of demarcating land both for new grants and for subdivision of land. We described these in the previous blog post. Specifically, we focused on the accuracy and attribution of spatial data required by the professional surveyor and government offices. Second, we completed a series of tests of affordable and ubiquitous technologies for capture and demarcation of land to see whether they achieve the thresholds required. We tested these tools under varying environmental conditions to see how they affect the measurements. We will describe the findings in several upcoming blog posts, starting with this one. Finally, we assessed whether communities can replicate the demarcation of land by the professional surveyor using these tools. We did this experiment by allowing community members to follow the professional surveyor and replicate his work. The first test of the tools was done under what can be considered ideal conditions with a clear field of view and good mobile network connectivity. We found that even under these conditions there’s a certain level of accuracy and precision of location measurements that each tool can achieve. Accuracy refers to the closeness of a measured value to a standard or known value and precision refers to the closeness of two or more measurements to each other. 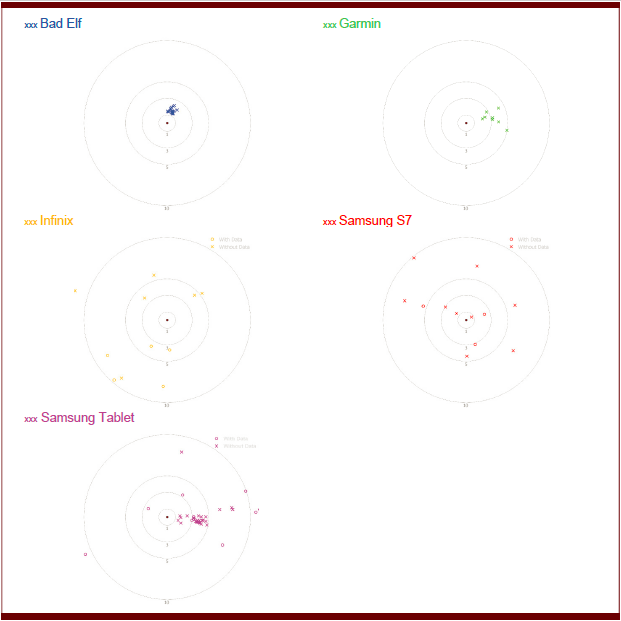 When we placed our GPS units and mobile phones above a known trigonometric point to demonstrate what type of accuracy and precision can be achieved in ideal circumstances, we found that accuracies and precision of tools vary. 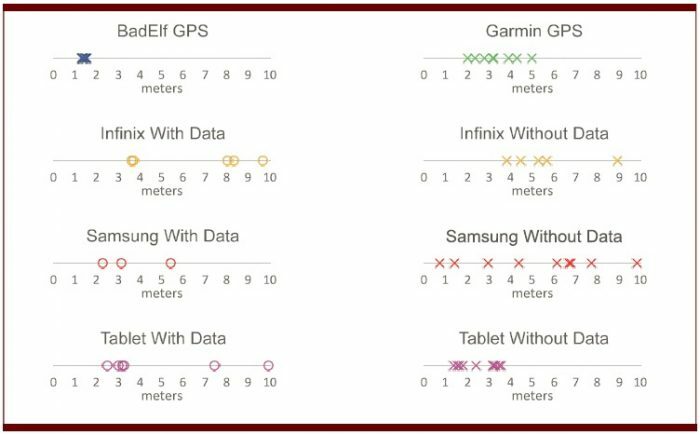 As we can see, the points taken with GPS units (BadElf and Garmin) fall between 1 and 3 meters from the known trigonometric point while the points taken with mobile devices fall between 1 and 5 meters. The measurements of GPS devices are relatively precise, especially the measurements of the Bad Elf GPS unit. The precision is indicated by the closeness of points on the horizontal line. 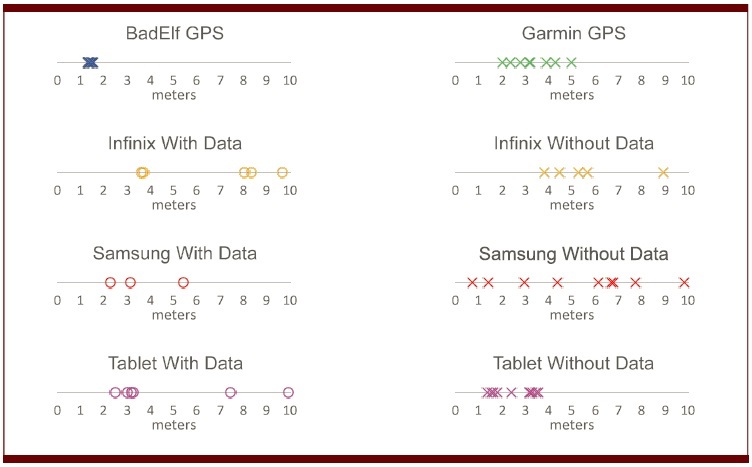 We also noted that access to the network data (with or without data) does not affect the accuracy or precision of the measurements of mobile phones. Next blog post will describe testing in so-called real-world scenarios.